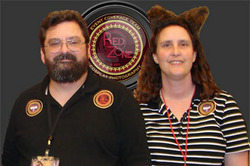 Tim & Kim Boothby are a team in every sense of the word, married for 25 years and founding members of Red Zone Fandom and the Fantasy Artists, Role-Players & Writers Guild. Through the Red Zone and Guild they support the fans of Anime, Cosplay, Fantasy, Furs, Gamers, Sci-Fi, and Steam Punk among a wide span of fan genres. They work to publicize and feature content and activities local to the great state of Idaho, where Fandom needs more voices.